We recently invited Land Rover Owner International magazine to visit Famous Four and see how we build up our popular Range Rover Top Tailgate kits. You can find out all the details now too, as they’ve published a full how-to article in their latest edition. 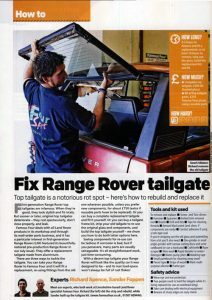 See our resident experts Rich S and Sander strip and reassemble a Range Rover top tailgate showing each step required with photos and detailed descriptions. More details are available in this months LRO magazine, out now. Famous Four Range Rover Top Tailgates kits and pre-assembled tailgates with glass are available via rangerovertailgates.com and famousfour.co.uk to order online today. Famous Four are one of the UK’s leading Independent British 4×4 Specialists, supplying parts, spares and accessories for the full Land Rover and Range Rover range. We also have servicing and repair facilities for vehicles new and old, as well as carrying restorations to suit many different budgets and requirements.